Screw holes didnt align 4 the seat its offset. i will have 2 drill a new hole 2! Awesome seller, fast shipping!!! Great products, will do business with again! Thanks! Very satisfied with all of it! 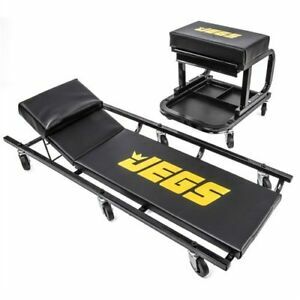 Bought this because I am tired of laying on the concrete when I do auto maintenance. Great deal for the money. Sturdy metal frame and reasonably comfortable cushion. Rolls well, even over bumps. For the money, this is a great deal. Ideal for do it yourself auto maintenance. The bench will come in handy for all kings of projects and will save my knees. We took delivery of this product and really liked the creeper! But the mechanic seat set was a total failure! The first one was not made well and none of the holes lined up to screw the pieces together. So we complained and they sent us a second mechanic seat which was even worse than the first one. My brother was visiting from out of town early so we celebrated Christmas with him 2 weeks early. Unfortunately, we had to take parts from both the first and second mechanic seast to try to make one. The quality of the seat was terrible. The creeper was really nice. Advise...Jegs should sell the creeper separately. It's sturdy and comfortable, but the mechanic seat made the whole thing look cheap. The welds were awful and the drawer mechanisms were all out of wack and cheaply made. The company did offer for us to return the entire order free of charge, but it was too late for us to buy anything else. We made due. My only complaints are that the seat padding is to thin and the drawer is hard to open and close. Otherwise it is a good set. Thought I was going for a 'cheap' version just to get by. I ended up getting a high quality set for what most creepers cost by themselves. Love it, and I used it almost every day. No issues what so ever. This is a solid buy guys and women must have for men easy to roll on around floors its nice to have head rest when you are under for a while, wheel caster are solid quilty it's a must have.